Typical Time and Energy Consumption for treatment of a 25000 Liter Transformer with the GlobeCore CMM-R12 - ! Equipment for Transformer Oil Reclamation. GlobeCore. This evaluation is based on the GlobeCore CMM 12R/CMM 4 Transformer Oil Regeneration unit with Regeneration Unit production capacity of 4000 l/h and 1600 kg of Fuller’s Earth in 12 columns. The GlobeCore CMM-R12 is able to regenerate 6400 liters of oil during one regeneration cycle. 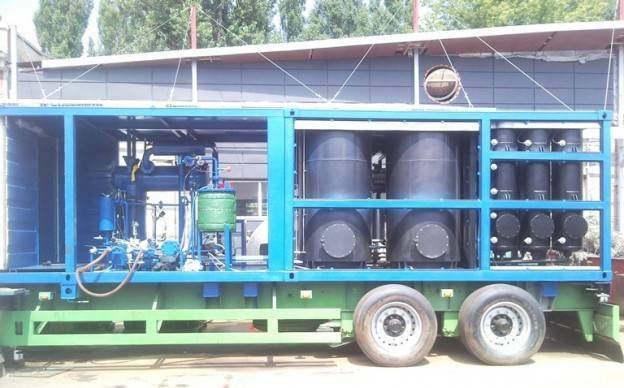 Globe Core Transformer Oil Regeneration Plant on a trailer. The GlobeCore CMM-12R production capacity calculation is based on initial oil acidity of 0.2mg KOH/g and is equal to 4 liters of regenerated oil per 1 kg of Fuller’s Earth. The amount of Fuller’s Earth required to treat oils with higher or lower acidity level will increase or decrease proportionally. At this average rate, it will require four (4) sorbent reactivation cycles to regenerate 25000 liters of transformer oil. In practice, the oil acidity level of an average transformer (acid number) may increase to values higher than 0.2mg KOH/g, thus, requiring more regeneration cycles. This is due to delayed maintenance that allows the transformer oil to become more contaminated which increases acid levels considerably. Ideally, oil regeneration should be initiated when the oil’s acid number reaches 0.08 and before higher levels of oxidation and contamination can damage the insulating paper. One of the main advantages of the GlobeCore Transformer Oil Regeneration units is that they use the GlobeCore Process which is capable of removing sludge deposits from transformer windings and insulation. This is achieved by increasing circulating oil temperature to the aniline point, which is usually around 80ºC/176ºF. Dissolved deposits of sludge are removed by the sorbent before oil is returned to the transformer. On-line (energized) oil regeneration therefore, does not only restore oil quality to “like new” conditions, but also clears the transformers of contaminants that could not be removed by simple oil replacement or purification processes. The De-sludging process will actually be more efficient and faster on energized transformers as winding vibrations and generated heat will also help to remove sludge. With average oil parameters, it typically takes 10-20 passes to de-sludge an energized transformer and up to 50 passes on a de-energized transformer. The number of operational cycles needed to regenerate 25000 liters of oil and de-sludge transformer windings will depend on the level of transformer contamination and can vary from 4 to 50 cycles. The example below shows average energy consumption and time required to treat a 25,000 L transformer. Estimation is based on 10 operational cycles. Oil regeneration plant connection diagram. The GlobeCore CMM-12R operational cycle consists of two stages: 1. Oil Regeneration. Takes 6-10 hours depending on transformer oil conditions. 2. Fuller’s Earth Reactivation. Takes 14-16 hours and depends on ambient temperature. Approximate duration of one operational cycle is 24 hours. Average energy consumption for one operational cycle on GlobeCore CMM 12R is 90 kW. In the “oil regeneration mode,” the GlobeCore CMM 12R consumes insignificant amounts of electricity (0.1-0.2 kW/h) as oil is being drawn through the Fuller’s Earth columns by Oil Purification Unit – CMM -4 . In “Fuller’s Earth reactivation mode” 12 Thermo- electric heaters (3kW/h each) are turned on for 40minutes (0.66 hour) to initiate sorbent regeneration: 12 x 3 kW/h x0,66 = 23,76 kW. Remaining 66.24 kW are used by Vacuum Pump and automation and actuating systems. Ten (10) operational cycles consumption will be: 90 kW x 10 cycles = 900kW. Oil Purification Unit – GlobeCore CMM-4 is used in conjunction with GlobeCore CMM 12R to remove dissolved gasses and moisture from the transformer oil before regeneration. CMM 6000 power consumption is 60 kW/h. The unit operates during both Oil Regeneration and Fuller’s Earth Reactivation modes. GlobeCore CMM-4 energy consumption during one cycle (24 hours) will be: 60kW/h x 24h = 1440 kW. Ten (10) operational cycles power consumption will be 1440 kW x 10 cycles = 14400 kW. GlobeCore CMM 12R/CMM-4will consume 900 kW + 14400 kW = 15300 kW for complete treatment of 25000 L of transformer oil. The transformer tank shall be topped up with transformer oil after treatment. 0. 3% to 1% (75L to 250 L) of initial oil volume will usually be required. One additional day is required to connect and disconnect the GlobeCore CMM 12 R/CMM-4 from the transformer. 25000 L Transformer: Oil treatment duration (including connection and disconnection) – 12 days. Electricity consumption – 15300 kW. Oil consumption – up to 250 liters. Note: this calculation is based on average oil conditions and assumption that CMM-12R/CMM-4 is operating on its full production capacity. While caring out regeneration on energized transformer it might be necessary to reduce the flow to prevent turbulence. Transformer Oil Parameters Before and After Regeneration.